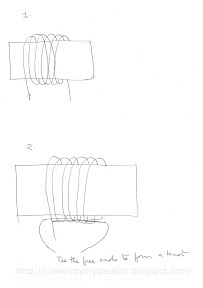 The rectangle shape in the pen sketches below is the folded toilet paper roll. Take the free end of the loop on the left and insert it into the loops towards the right. 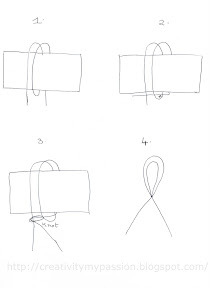 Make a knot with the free ends. Twist and flatten it. Remove the loops slowly out of the roll. 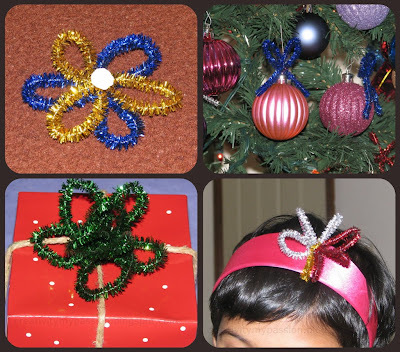 *Be cautious of the sharp edges on the glitter sticks! Pretty creations! Love your box of goodies! Oh, these are super cute!! My girls would love to make these! Great idea using the toilet paper roll to make your loops. I love the flowers best. I think a bunch of red poinsettia type flowers made that way would look nice with a stem in a vase. Thanks for sharing your idea with Monday Madness. Ooh so many cute things made from the humble pipecleaner!